Holly leaves are amongst the toughest in the plant kingdom, spiny, leathery in texture, with thick cuticles. They also contain an alkaloid, ilicin, that discourages insect attacks, though not larger browsers. They spend several years on the tree and, when they finally fall, take a long time to break down. Fungi are the main agent in their decay. 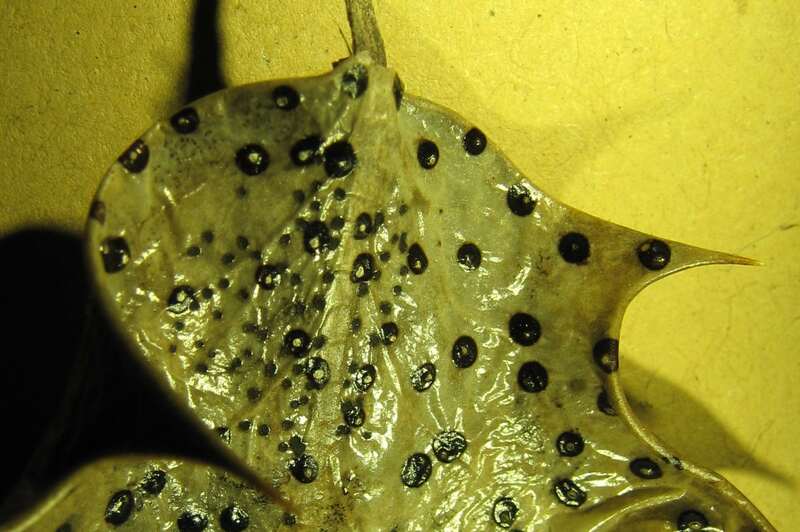 In the spring, fallen leaves bear the spent fruiting bodies of at least two species of fungi exclusive to holly. These photographs are of leaves collected by Gwen Richards in a woodland between Torbreck and Ardroe (NC078244) on 12th March 2017. 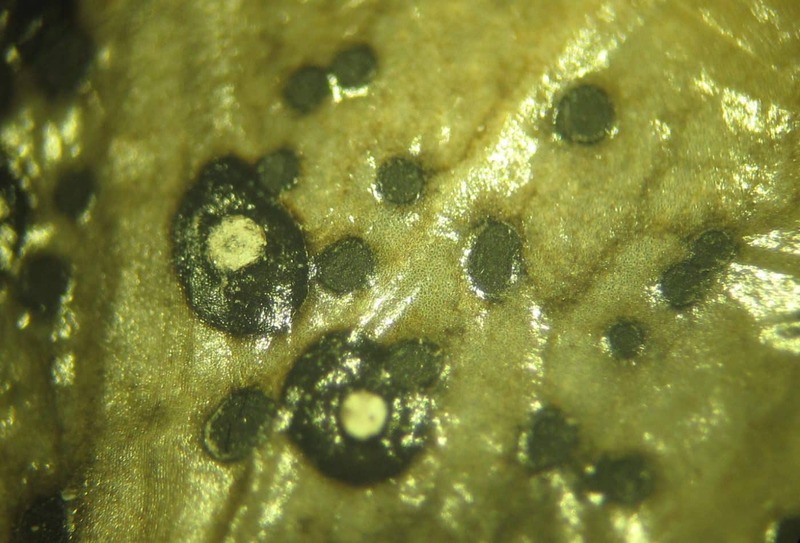 The larger shiny black bodies, often with several apertures, are pycnidia, producing asexual spores, of Phacidium lauri (formerly Phacidiostroma multivalve). Amongst them, in some areas of the leaves, are the much smaller pits of apothecia, producing sexual spores, of Trochila ilicina. These open by a pale lid, exposing an olive green disc. Between them, these two ascomycete or cup fungi convert most of the tissue inside the leaves into the silvery skeletons shown here. Presumably both enter the leaves through the stomata on their lower surfaces. 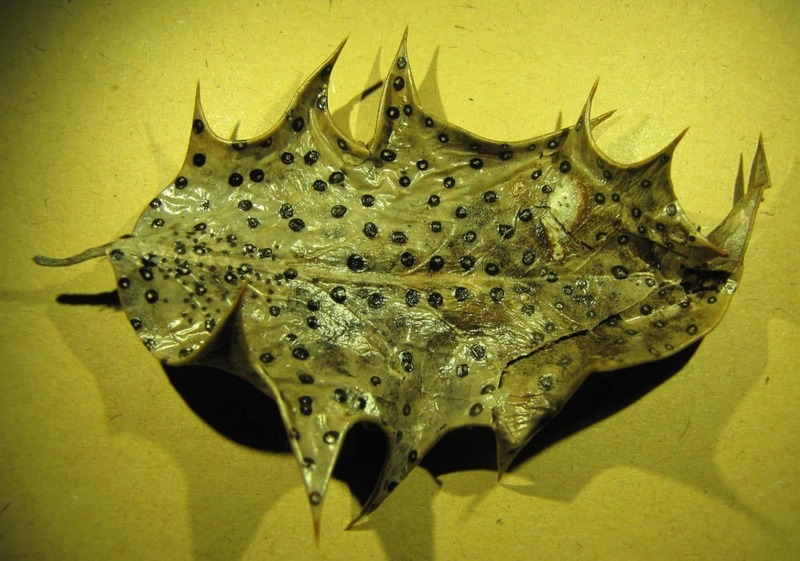 These old holly leaves are a reminder of the vital role that fungi perform in recycling the tissues of higher plants. They are also, in their way, objects of beauty, if on a miniature scale.